Maybe it's just me, but lately I haven't really been wowed by anything I've read. As soon as I learned about Lumberjanes I wanted to get my hands on a copy of it; the idea of a summer camp in which a group of teenage girls fight monsters sounded right up my street, so I preordered it, and after I fell in love with Rat Queens and Ms. Marvel earlier this year I was eager to pick up another graphic novel full of ladies! Sadly, I was a little disappointed with this one. That doesn't mean I didn't like it, because I did. More than anything I thought this was very cute; the art was cute, the characters were cute, and the sense of humour was very cute. It didn't make me laugh in the way Rat Queens does, but I'd be a big fat liar if I said it didn't coax the odd grin out of me. Plus, if I'm being honest, it was quite nice to sit back with a graphic novel where the whole world wasn't in danger. 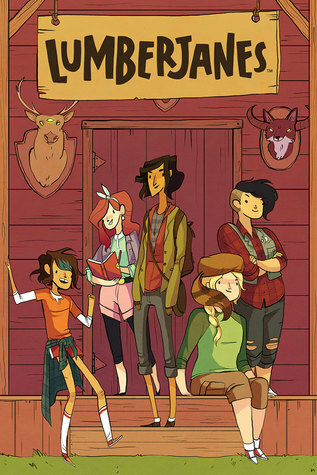 In fact Lumberjanes, for me, felt very reminiscent of some of the fun animes I watched during my teens, such as School Rumble and Ouran High School Host Club; entertaining, lively stories that bordered on silly but managed not to go overboard by adding in dashes of tragic backstory or issues that brought the characters tumbling into our reality. Lumberjanes is no different. Yes, the humour is gloriously cheesy and there are monsters, but it's also another wonderfully diverse series including POC and LGBT* characters, and that always makes me happy. I was just expecting something more from it. I wanted it to completely surprise me like Rat Queens did, which might well be why it didn't. I didn't find the characters as memorable as the ladies in Rat Queens; despite all of them looking completely different, I struggled to distinguish them from one another and still probably couldn't tell you even one of their names. I think a lot of this has to do with all of them sharing the same sense of humour, which was a very fun sense of humour, but it didn't make it any easier to tell them apart. I felt very much like these were characters rather than living, breathing people. However, this is only the first volume and there's certainly a lot of potential for some great character development. Perhaps I'm just being a little hard on it! So Lumberjanes didn't blow me away, but I did enjoy it and I will be carrying on with the series, and if you prefer your stories to be more playful than end-of-the-world epic then this is a series for you!